The largest bus available, this modern bus can hold up to 56 passengers comfortably. With ample luggage space and plenty of room to spread out, charter buses are great for long distance trips for students, employees, wedding guests, and more. 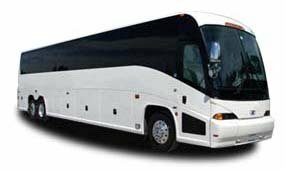 Boston Charter Bus Company can help you streamline all your group transportation for weddings, corporate events, sports teams, school groups, and more. Our reservation specialists are available 24/7 at 617-314-7577 to help you plan your trip.